LangstonHughes is a Legacy Library. Legacy libraries are the personal libraries of famous readers, entered by LibraryThing members from the Legacy Libraries group. » Langston Hughes's legacy profile. LangstonHughes is also an author. 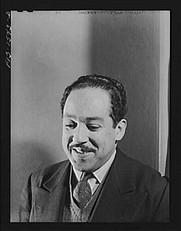 » See Langston Hughes's author page. About meLangston Hughes (1 February 1902-22 May 1967), American poet, author, and activist. About my libraryThis LT catalog is drawn from extant copies from Hughes' library in the collections of Lincoln University (PA) and the Beinecke Library at Yale University. Note that many of these are Hughes' own copies of his works. Additional books are sought; please contact JBD1 if you have any information on other Hughes-owned titles.